We like chickens for a lot of reasons, some of them even practical. The birds are fun. They can be a bit zany at times, are pretty, will come up to be hand-fed, and occasionally chase the cat or dog. 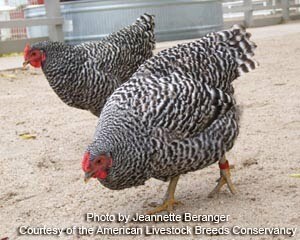 On the useful side, chickens produce eggs, meat, and a very hot manure that helps nitrogen-loving plants thrive. Given a bit of free range, chickens will de-bug the garden faster than a computer geek on a Windows malfunction. They also like to eat a lot of what we would otherwise toss: eggshells, whey, fish parts, and stuff teenage girls describe as "gross." 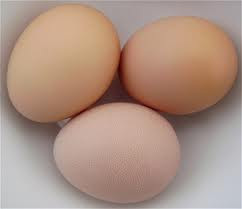 In return they grow, reproduce themselves, and give almost daily eggs. Not a bad tradeoff! 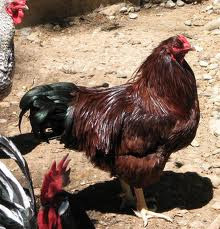 In keeping with our philosophy of encouraging breeding rare and endangered heritage livestock breeds we have our eyes set on some very interesting breeds of chickens. We like Dominiques and Delawares, and we're looking at perhaps some Buckeyes and Barnevelders. Maybe a few booted Cochins around for elegant looks. 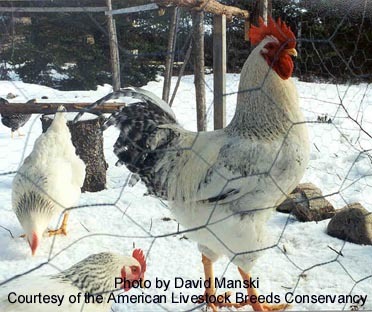 I had several running around my farm in the Catskills and they always got attention, plus laid great eggs. Some of the essential qualities we seek, with chickens and other livestock, are that they are gentle, easy to manage, and can make a living free range for the most part, all characteristics that typify heritage breeds. We want excellent layers and quick growers for meat. We value independent birds who are smart enough to find a bug or two and to stay out of the way of predators. Naturally, they will have a house for nighttime security. We may even employ a "chicken tractor" on an as-needed basis to allow the chickens to follow other species on pasture, cleaning up the mess - (Teenage Girl Gross-out Alert - chickens scratch through manure, eating the maggots, seeds, and other critter in the stuff, and breaking it down for easier processing in pasture lands), and all the while growing bigger and more productive. Our strategy is to bring on a single species at a time, give the chickens time to adjust, learn how best to manage from a limited number, evaluate how many we will need eventually for meat, reproduction, and eggs, and keep breeds true. If all goes well we envision separate flocks of different breeds working rotating areas of the land simultaneously. There are some very reputable breeders in the Midwest who can help us get started with chicks, and we are already in touch with three farms in the Missouri Ozarks who have welcomed visits from us after learning about the Valhalla Project. My Buff Orphingtons chickens eat mice and snakes. They are just as good as cats if they are not fenced in. Mice quickly learn to go around a chicken pen.